I feel a great loss with the death of Apple founder Steve Jobs. Jobs, like no other in the technology world, was an evangelist for great design. He showed the business community that creativity could actually result in big profits. Certainly there are others like Steve Wozniak that contributed to the success of Apple; however, it was my experience that Apple was much better with Job’s leadership than without. Good design produces products that are visually pleasing, useful and easy to understand. Poor design spawns irritatingly overcomplicated products. Remember having to enter all those MS-DOS command lines before Mac’s GUI (graphical user interfaces)? Or reading the 100-page manual of your new mobile phone before the iPhone, which is so easy to operate that you don’t need an instruction manual? My history with Steve Jobs’ products runs deep. In November of 1989, I left CP&B to start my own agency. My business plan was to automate the manually intensive processes of an advertising agency studio with the latest technology. Being a recent college graduate, I was familiar with the new world of desktop publishing that had been invented by Apple in 1985. The idea was to utilize a Macintosh II computer (maxed out with a 20 MB drive and 128 MB of RAM), an Apple LaserWriter, a Canon color copier printer and one designer (me) to do the job of 5 people at a traditional ad agency. I had no money or business experience, so I pitched the idea to my unsuspecting father-in-law. With his backing, our Miami advertising agency was born. 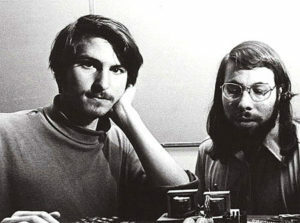 Steve Jobs and Steve Wozniak (circa 1975). With the exception of the Lisa and Newton, over the last 20 years, I have purchased just about every product Apple has produced… From Claris Works, the Performa and Power Book to Aperture, the iPad and the Mac Mini. My allegiance to Apple products has been tested over the years. During the mid 90’s, the Apple product was not great. I must admit that I did buy a few Mac clones (remember the StarMax?) along with several Windows machines. Not until Steve Jobs was hired back in 1998 did Apple turn things around. Most professional designers obsess over details – It’s what we do by inclination and training. What separated Jobs from most was his obsession with unequivocally placing the user experience over everything else. Apple will continue on. But Steve Jobs’ vision will never be replaced.